It’s an appellation from the ancient world that saw some use in the nineteenth century. 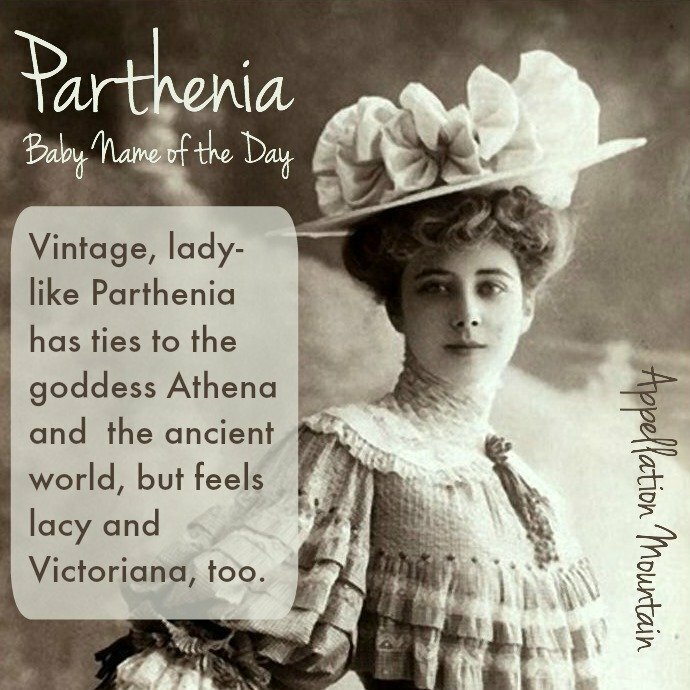 Thanks to Winter for suggesting Parthenia as our Baby Name of the Day. Parthenia is, in some ways, a goddess name. But it feels more like an overlooked nineteenth century gem than an ancient appellation. In the ancient world, one of the goddess Athena’s epithets was Parthenos – Virgin Athena. In Greek, parthenos means maiden. Thus, the Parthenos was the towering temple constructed in her honor on the Acropolis in Athens. She wasn’t the only maiden in Greek myth, but for Athena, this attribute was central. She was a rule-follower and an enforcer of order. And it squared with ideals about how women ought to behave in Greece. Construction on the temple began in 447 BC, and took more than a decade to complete. While the ruins are still visible in modern Athens, much of the artwork was removed by the British during the rule of the Ottoman Empire. Now known as the Elgin Marbles, they are currently visible in the British Museum. Discussions continue about the return of the Marbles continue. 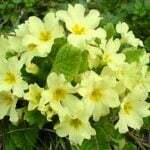 Poet Sir Philip Sidney may have been the first to use Parthenia as a given name, in his 1590 Arcadia. It was actually his second version of the work, so it’s sometimes known as New Arcadia. His Parthenia first appears in the second version. She’s the wife of Argalus. Their love is perfect, and they’re both virtuous. Despite all that goodness, they don’t have a happy ending. But Sidney’s work was widely read, and it is easy to imagine parents embracing the character of Parthenia for a daughter’s name. Looking for an unexpected musical name? The first printed collection of music for keyboard in England was called the Parthenia. It was published around the year 1612. Another use of the name came from Friedrich Haim’s Der Sohn der Wildnis in 1842. I can’t find much about the plot, save for this: womanly love triumphs over masculine barbarism. Haim was a very well-known writers of plays, poems, and novels in the mid-1800s, so some of those Parthenias may have been named after Der Sohn der Wildnis. There was also a novel by Eliza Buckminster Lee titled Parthenia, the Last Days of Paganism, published in 1858 – but I’m not clear of the novel’s plot or just how widely read it might have been. But parents were hearing this rarity somewhere, because there definitely were some girls given the name. Parthenia hugged the fringes of the Top 1000 during the nineteenth century, making it more common than you might guess. 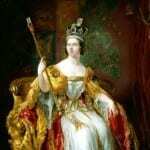 Eugenia, Antonia, Lavinia, and other ends-in-nia names were doing well in the era, so while Parthenia was never common, it wouldn’t have been outlandishly different. Today, though, this name would be distinctly different. Just seven newborns were named Parthenia in 2014, and over the last decade, it’s usually been rarer still. Of course, that could make for an opportunity. If you prefer your names elegant and rare, and don’t mind a little of explaining, there’s a lot to love about Parthenia. What do you think of Parthenia? Undiscovered gem, or too antique to use today? Thank You so ooooooo much for doing this post. I’m sorry that I’m late to respond. 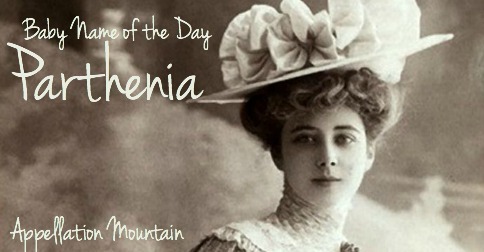 My great-grandmother was named Elva Parthenia and her daughter (my grandmother ) was named Virginia. I find it particularly interesting that both mother and daughter held the same meaning (virgin) in their names. Sadly, both have passed away a long time ago, and unfortunately, I wouldn’t be able to ask them if that was intentional or accidental. My grandmother Virginia was born in 1916 and her mother, my great-grandmother was born 1897. Either way, Parthenia had soo many spelling it allows for many nicknames to help make it transitional into the 21st century. Thea or Thena are my top two choices. Parthenia is very much an upright elegant name while allowing the parents the luxury of its rarity without having to choose the usual choices like Catherine or Elisabeth, which are quite common. Also, I love Sophronia too! Nickname? Thea? Nita? Hmmm… Party?! I also have seen genealogy records with Parthenia on them (next to Sophronia!). Most have been from a century-plus ago and the Midwest. I think Parthenia was more popular than what the SSA stats would lead you to believe. I often come across corruptions of Parthenia in my genealogy research – Parthema, Parthena, Perthema, etc. On a recent episode of Who Do You Think You Are (UK version), Jerry Hall traced the roots of her great-grandfather James Hall who married a woman named Parthenia. James Hall was from England, but Parthenia seems to have been born in Texas sometime in the second half of the 19th century. Don’t really care for it. Prefer it as a middle.